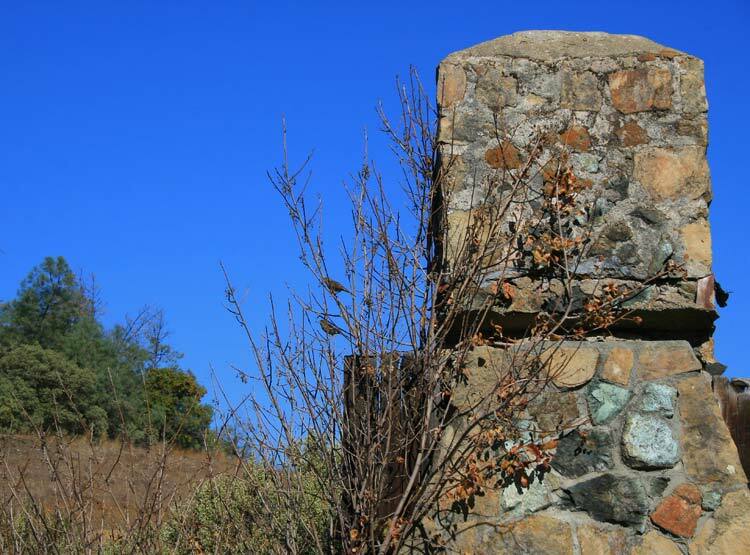 Once slated for development, now protected for public use. 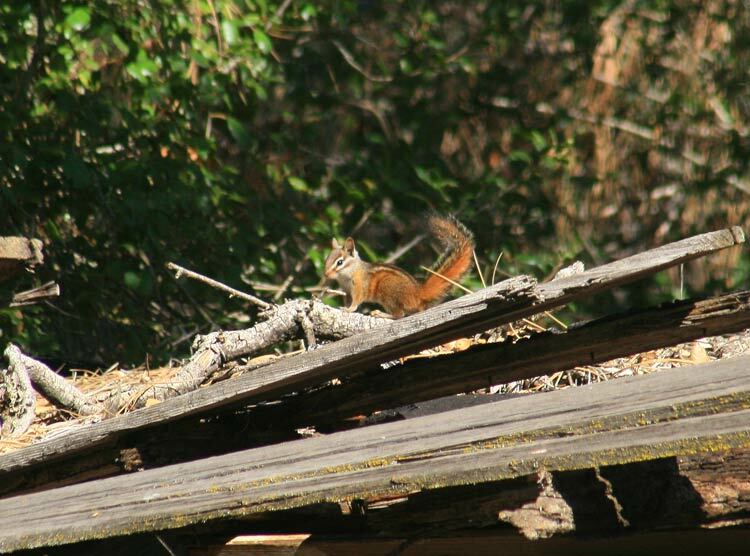 Dilapidated shack and adjacent wood pile has become a man-made wildlife habitat. 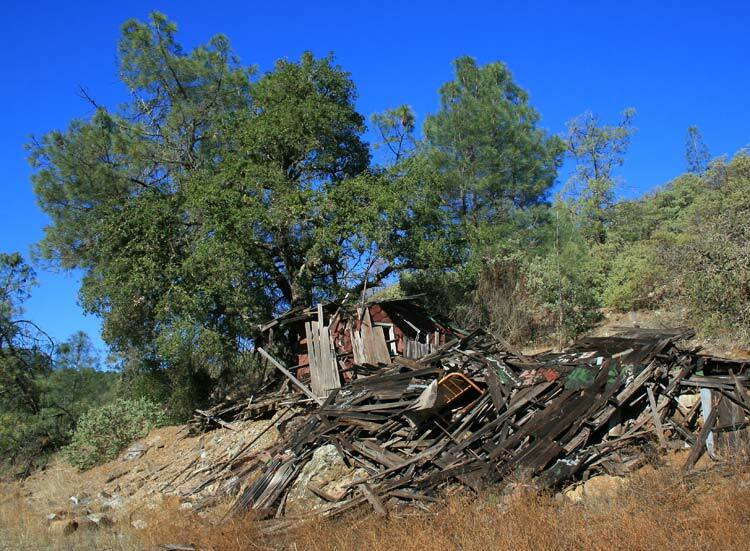 An entire ecosystem develops when trash, trail-clearing debris is left in place. 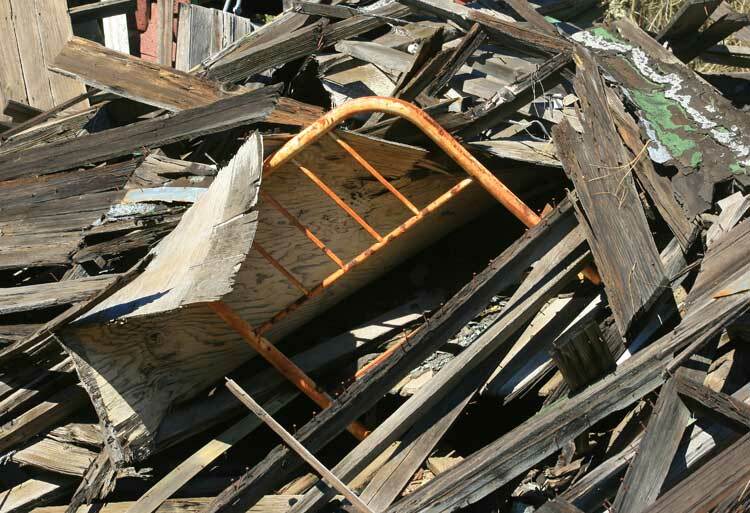 This trash heap is several feet deep, a virtual labyrinth of tunnels and passageways. 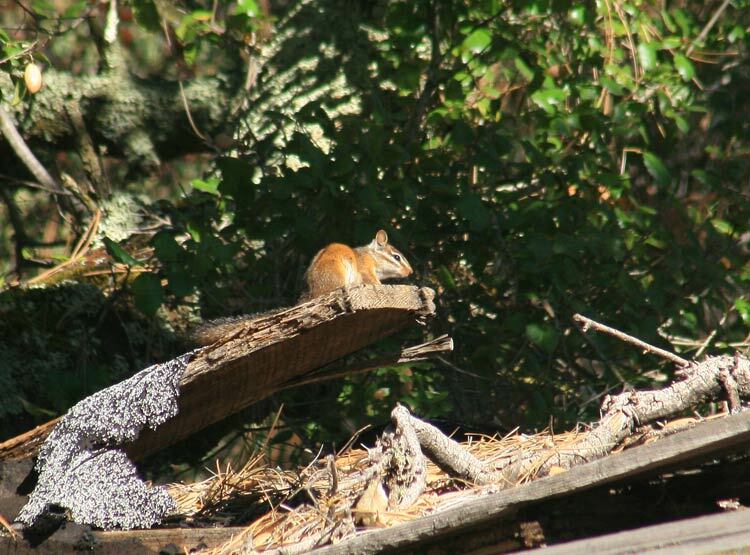 Scampering among the debris, a Merriam's Chipmunk. 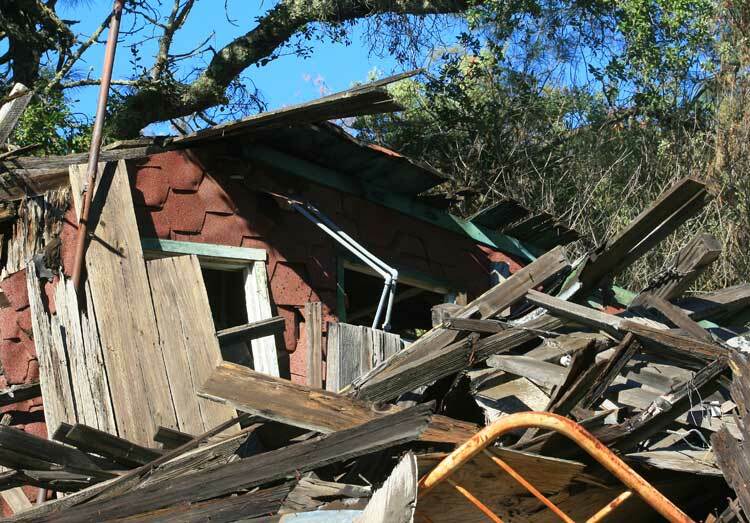 and habitat destruction drastically reduced their numbers. 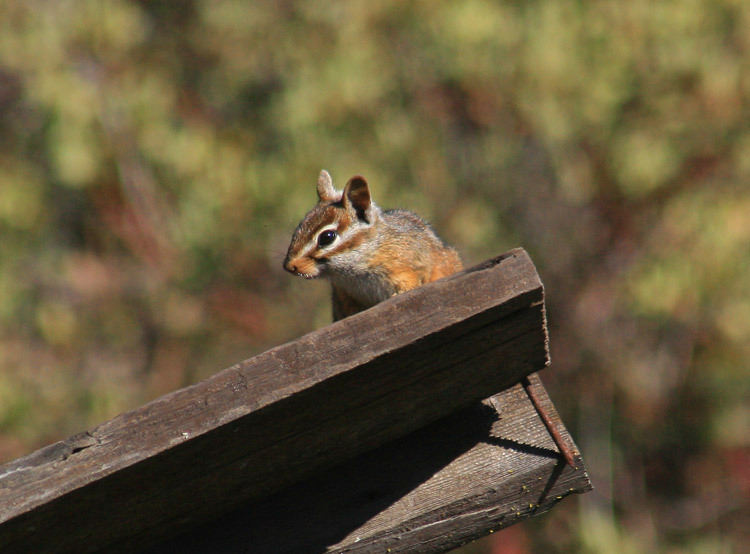 Atop its look-out, this chipmunk repeatedly chirped its warning call alerting other wildlife to my presence. 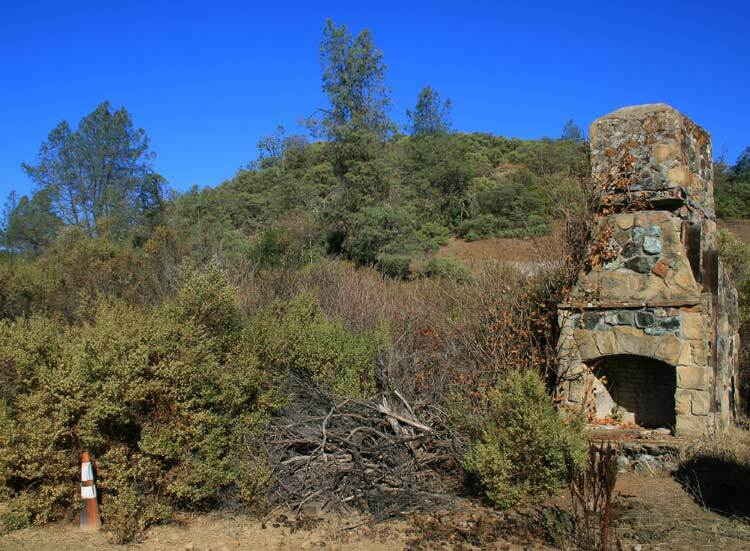 Nearby, an old cabin chimney is all that remains. 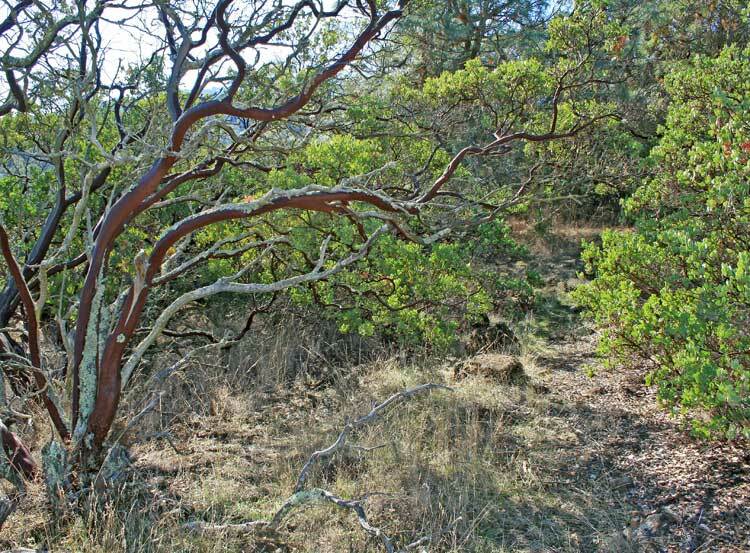 A large poison oak bush attracts a variety of birds who come to eat its berries. 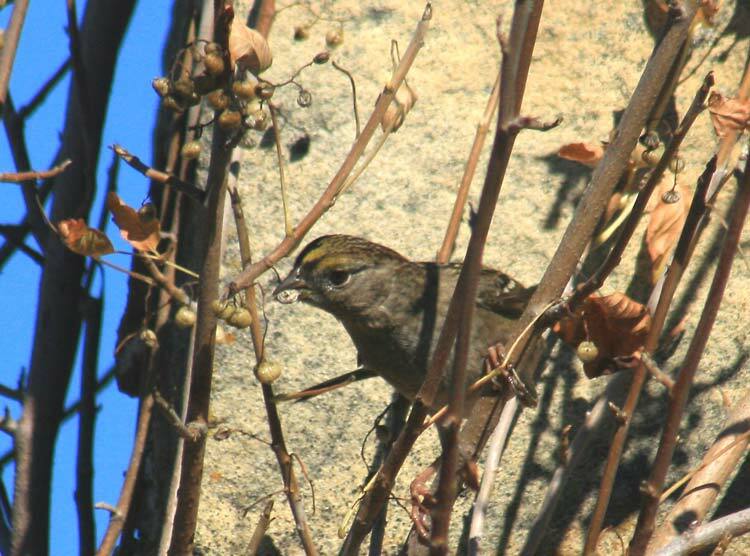 One of several gold-crowned sparrows who've come to feed. 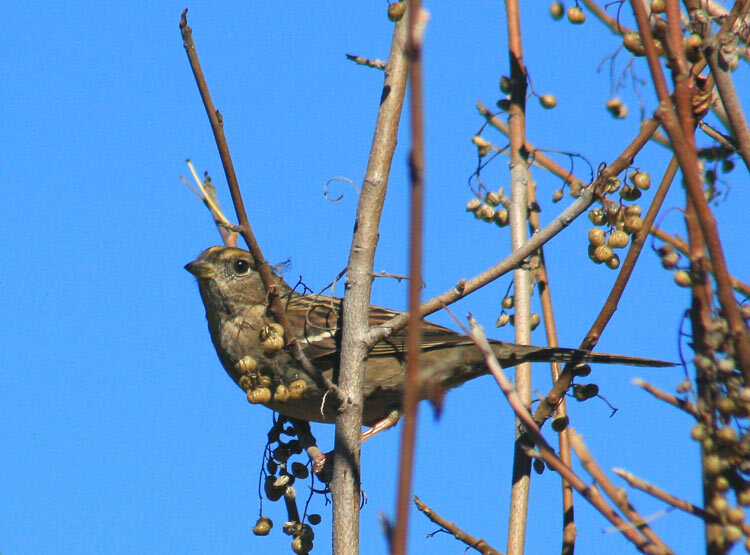 The seeds from poison oak berries pass harmlessly through birds. 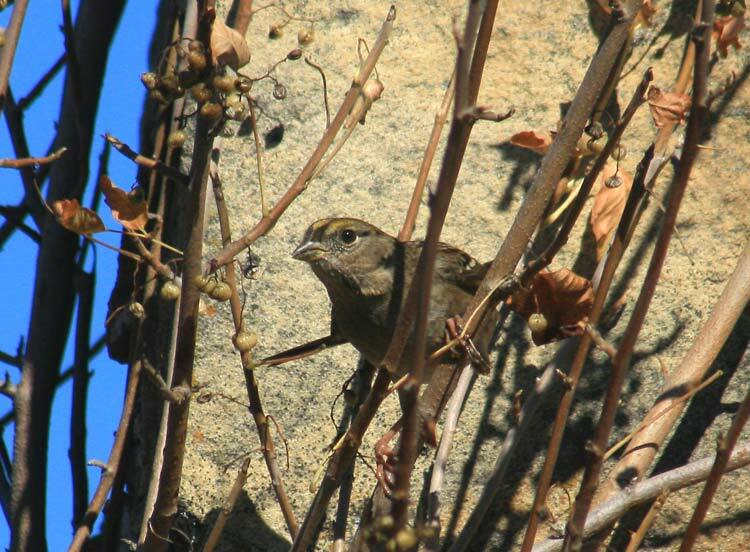 Bird droppings spread poison oak seeds throughout the area. 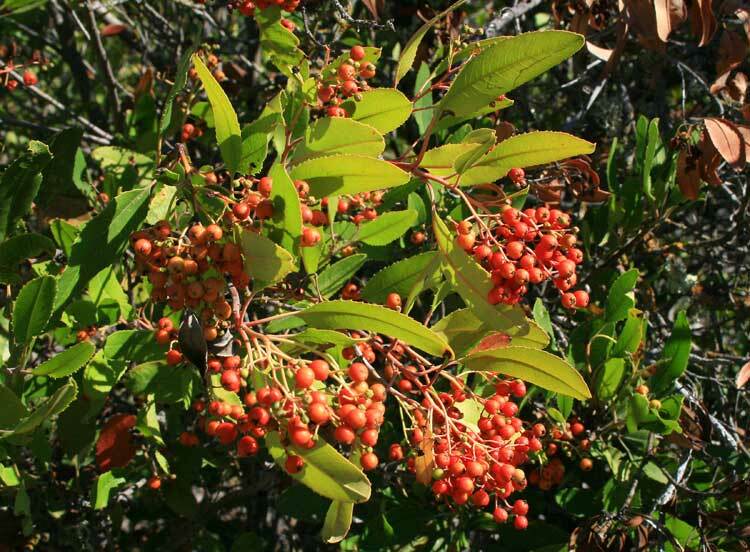 Soon not a berry will remain. 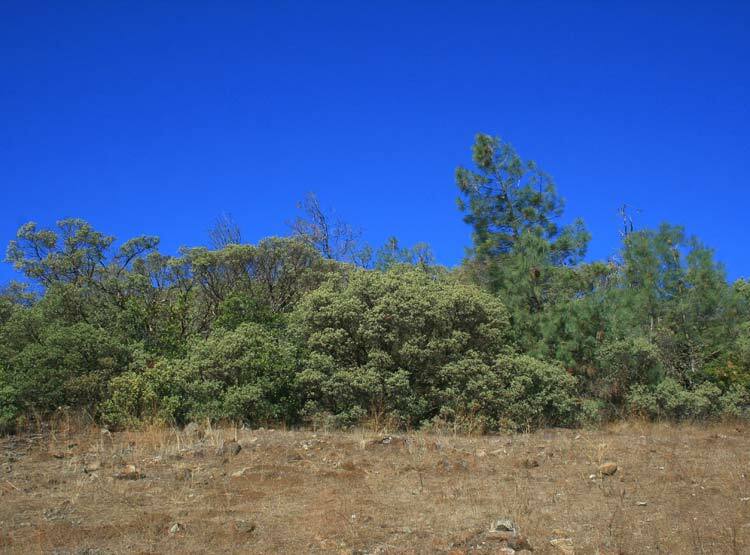 A clear division between serpentine grassland and chaparral habitat. 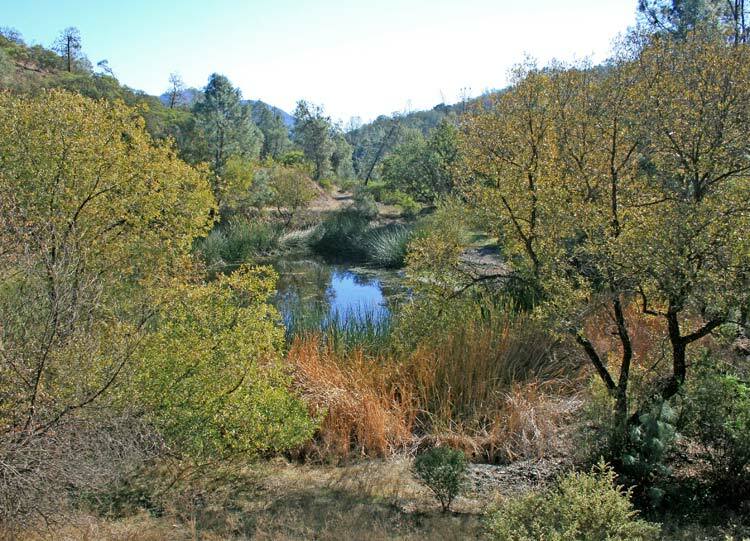 What at first seems impenetrable is actually an entire network of animal trails beneath the chaparral canopy. 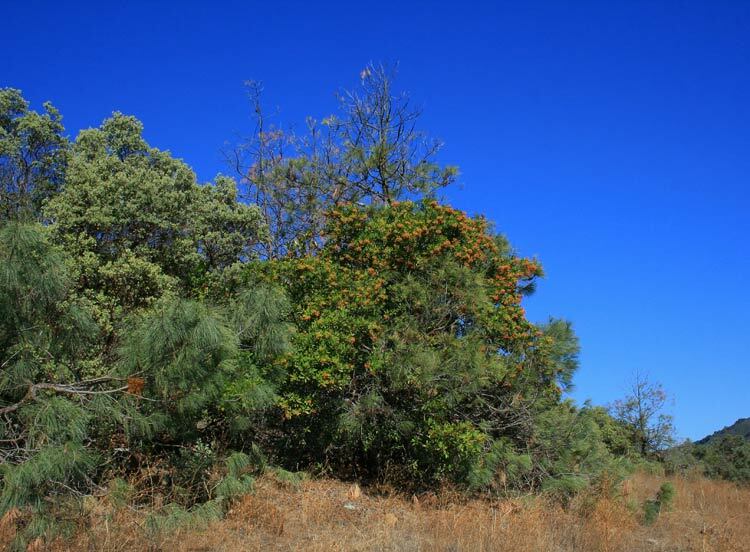 A dense stand of gray pine and toyon. 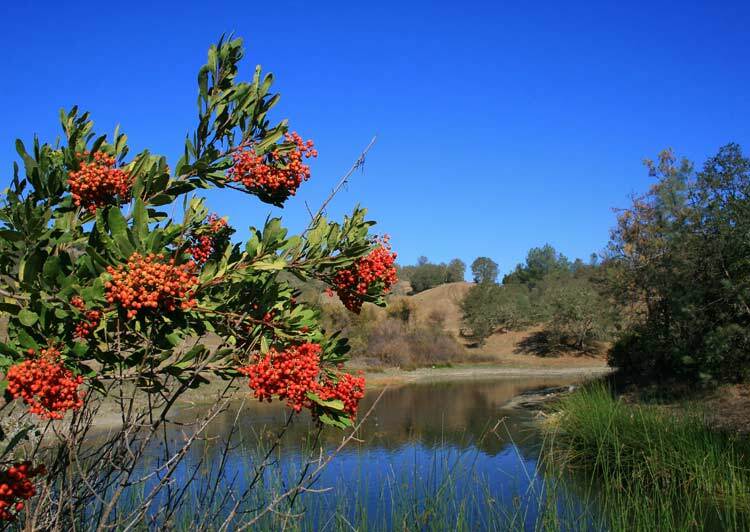 Toyon berries provide food for local wildlife. 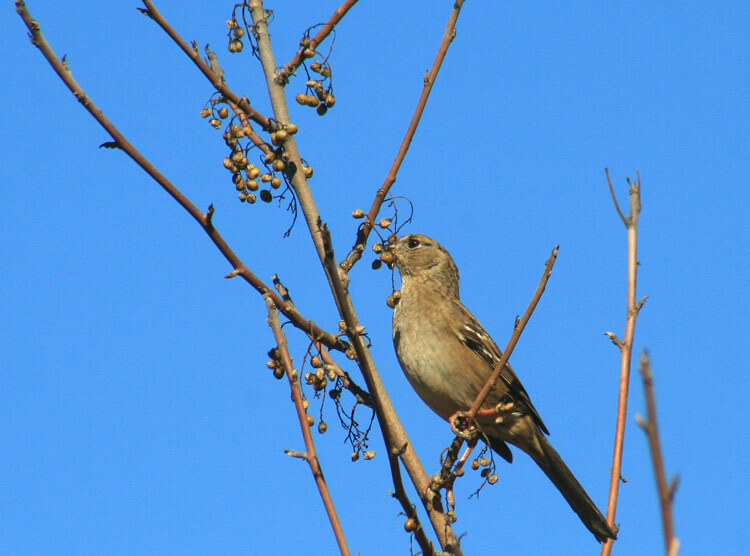 Birds particularly gather to feed on the berries. Like the old woodpile next to the cabin, this decaying gray pine also provides habitat for wildlife. 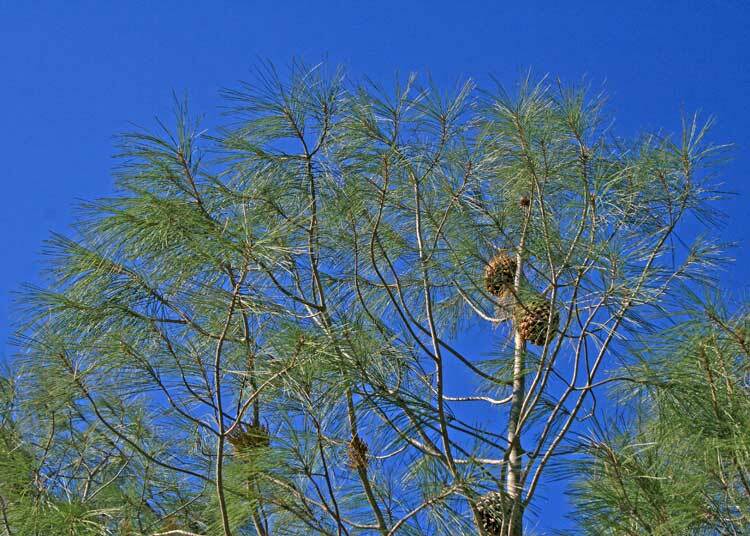 Seeds from gray pine feed squirrels, mice and birds. 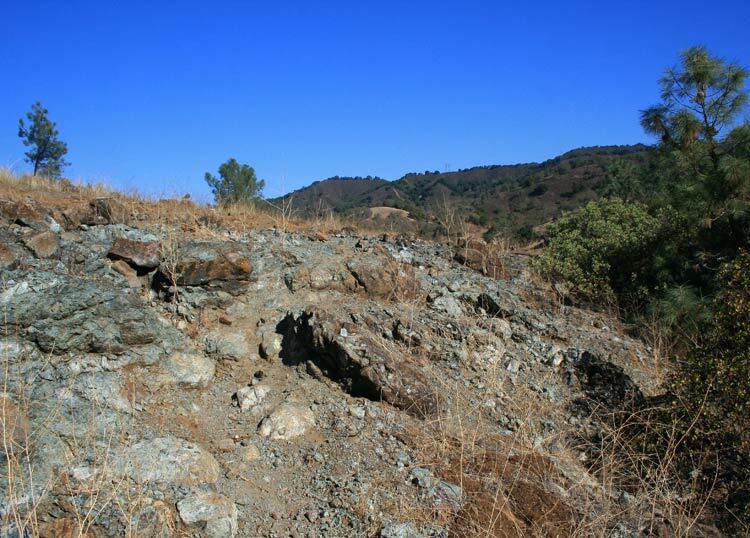 Chaparral gives way to a large outcrop of serpentine. 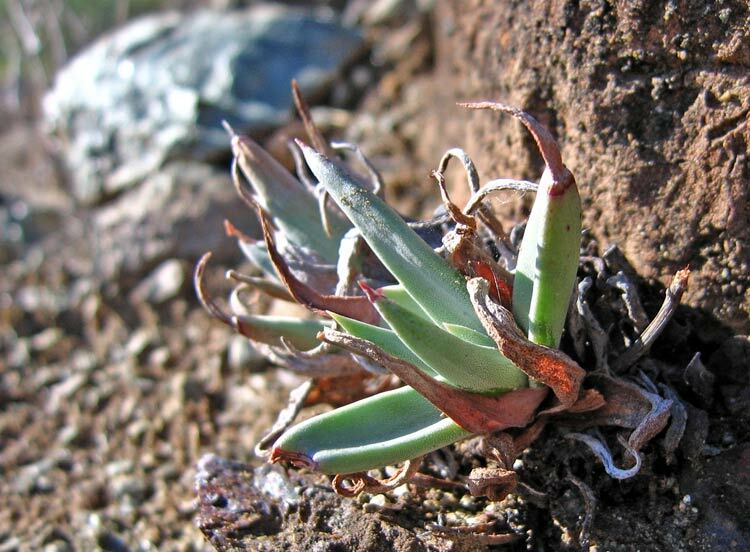 Dudleya is often found growing in thin, nutrient-poor serpentine soil. 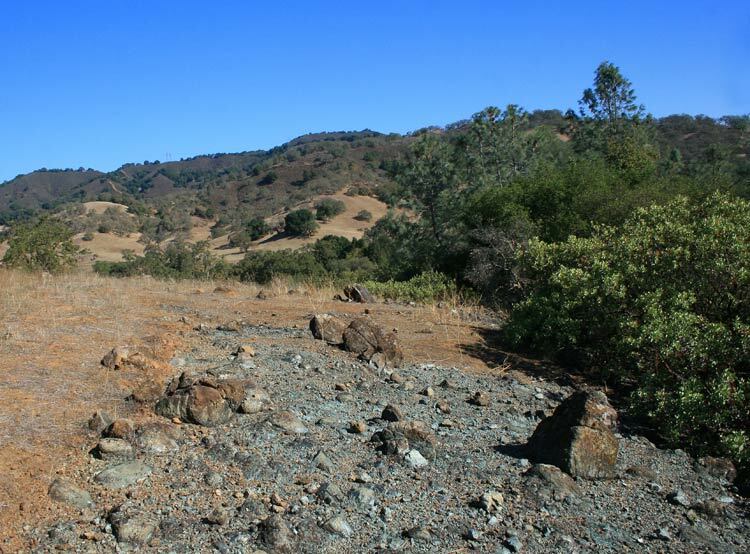 What appears to be a patch of "scorched earth" is actually exposed serpentine. 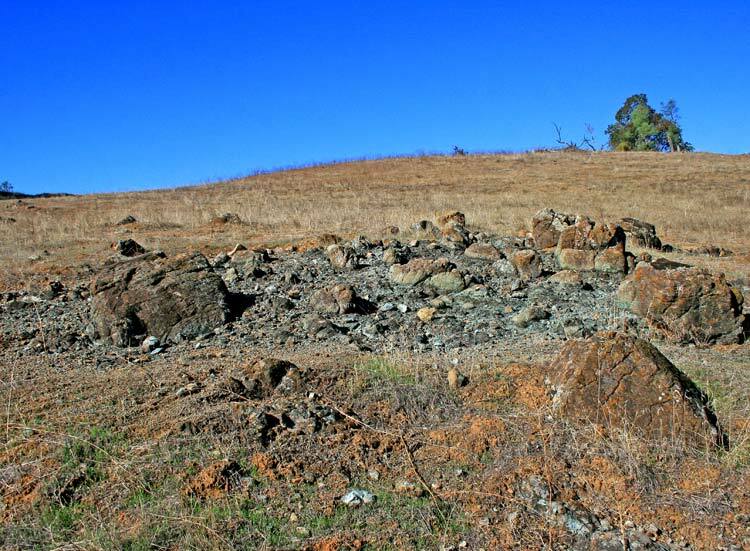 Come spring, this serpentine outcrop will host several endemic wildflowers. 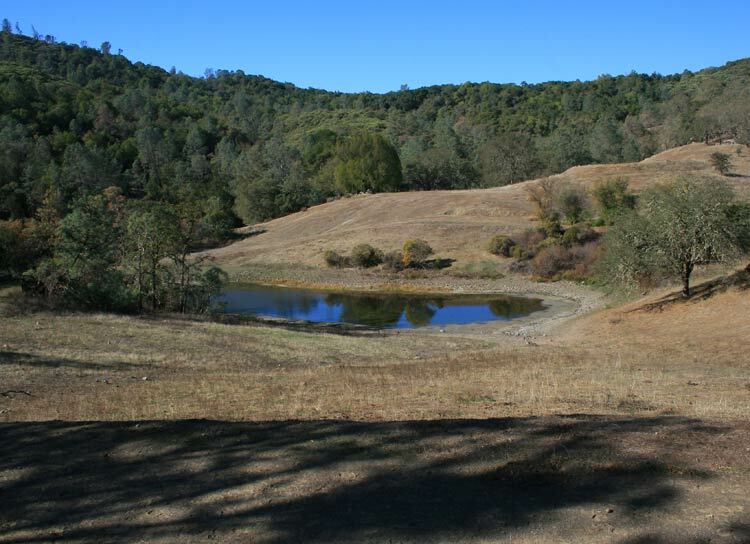 Stock ponds are created by ranchers to provide water for cattle. 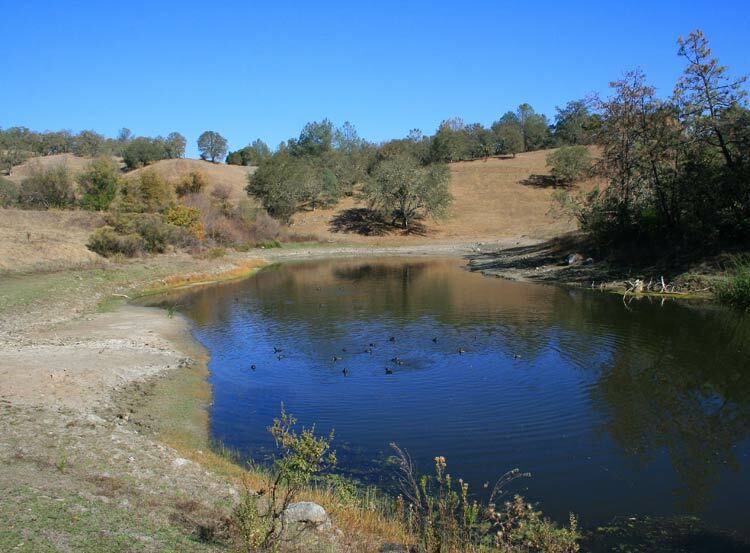 Stock ponds also create habitat for wildlife, including threatened species like western pond turtles. 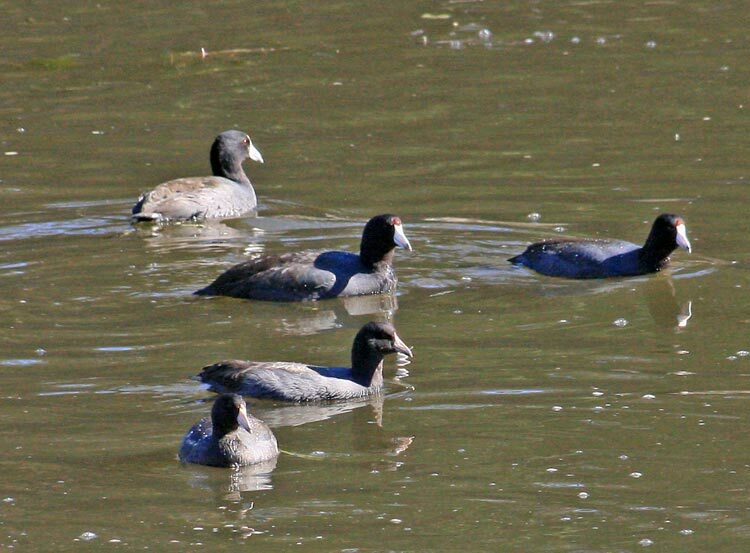 Coots are commonly found in stock ponds. 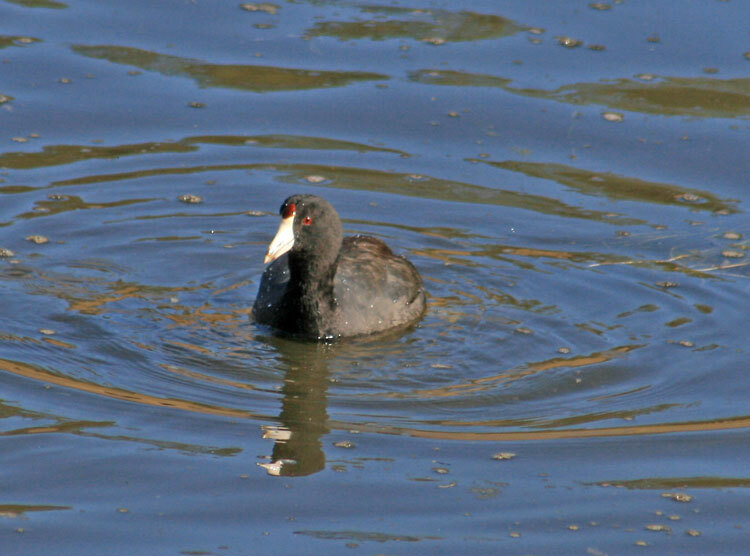 They use their strong beak to forage for food under water as well as along the shoreline. 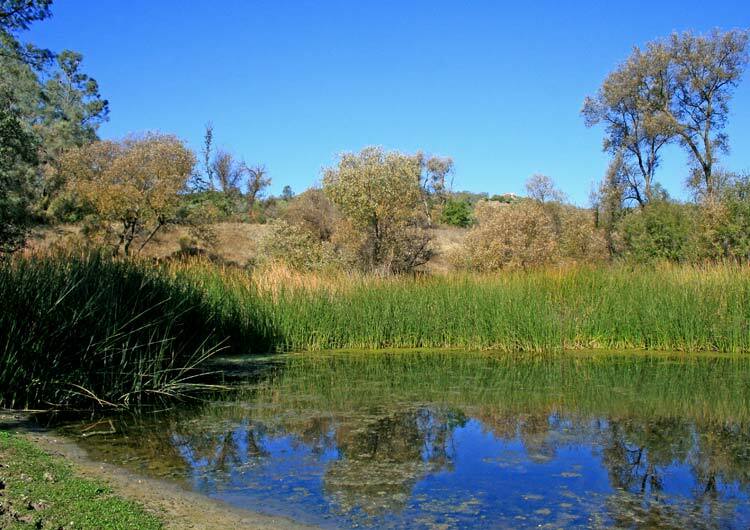 A thick stand of tule reeds line the shore, habitat for numerous wildlife species. 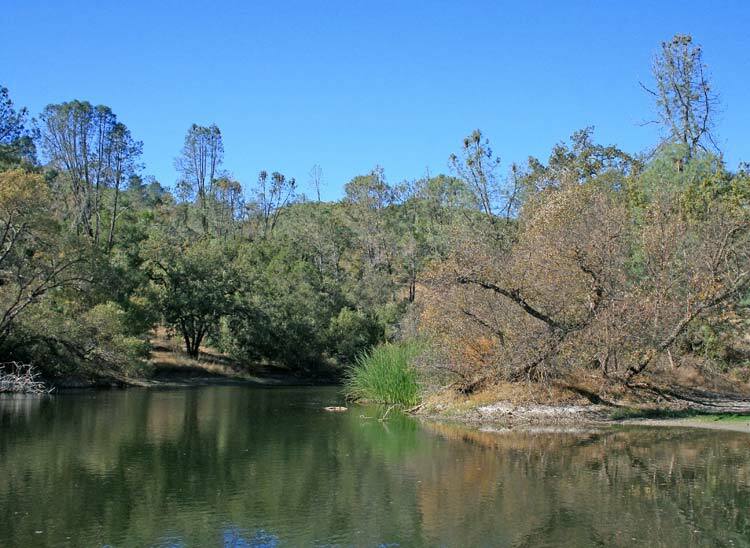 This is the first of three stock ponds that cascade into a nearby canyon. 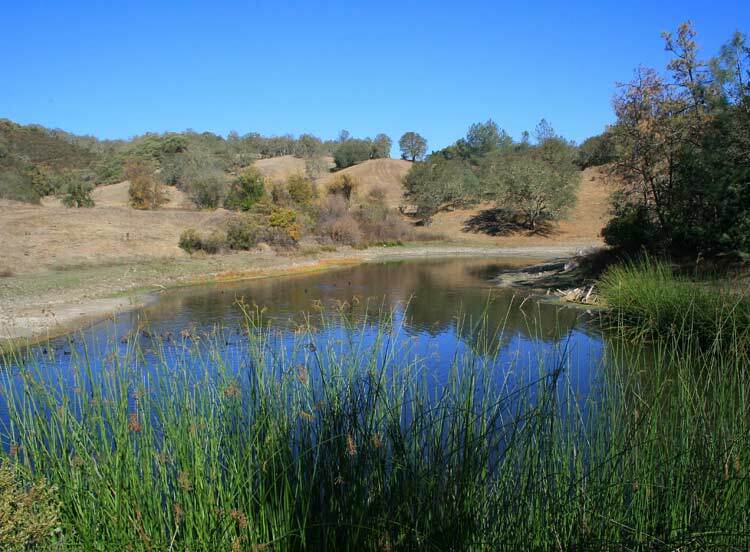 The second pond is also edged with tule reeds. 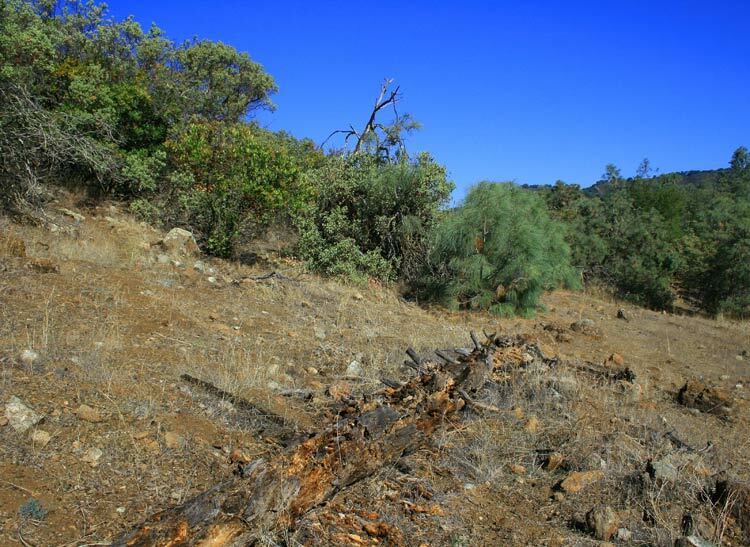 Grassland has now given way to chaparral and mixed oak woodland. Mature willow, gray pine, oaks line the shore. 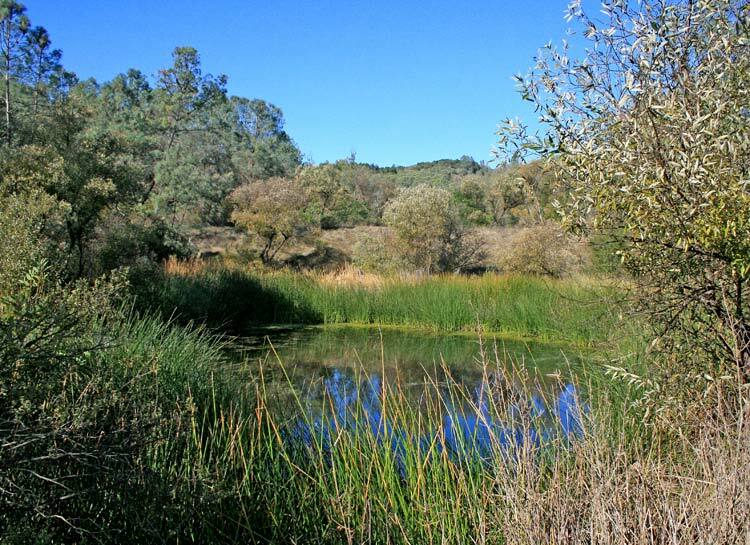 Last and smallest of the stock ponds is set like as bright jewel in its surroundings. 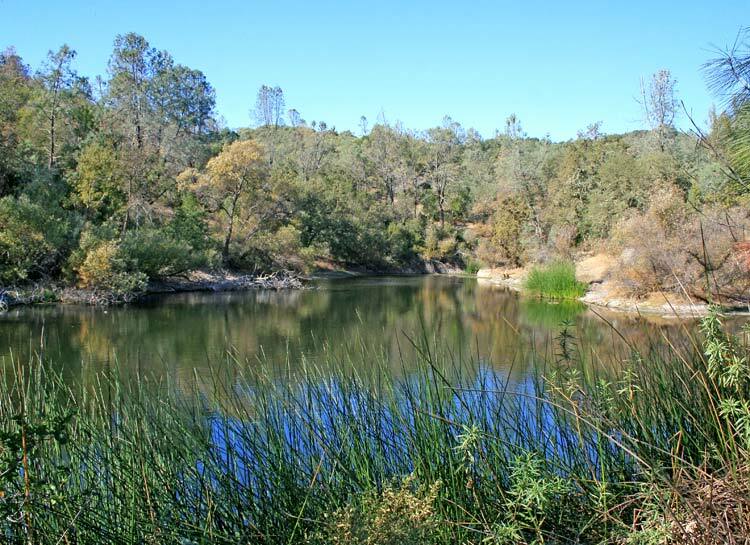 Thick stands of tule reeds crowd sections of its shore. 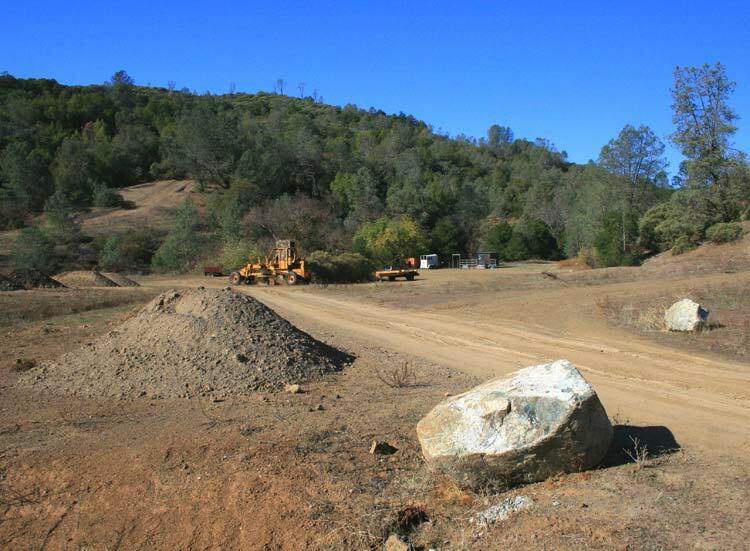 For more information about this new preserve, visit Santa Clara Valley Open Space Authority web site.